Americarpet: How is Bamboo Flooring Made? Bamboo is one of the strongest building materials and understanding how bamboo flooring is made will help the consumer choose the best type of flooring for their needs. Bamboo is a high-yield renewable natural resource. It is grows all over Asia. Most of the bamboo available in the United States has been harvested and manufactured somewhere in Asia. It is considered to have a low environmental impact. It is not classified as a tree, but is actually a grass, and so grows very quickly. It is, in fact, the fastest growing plant that we know. It can grow up to 4 feet in a day. Where oak takes 120 years to grow to maturity and 25-35 years for Spruce, Pine or Fir, bamboo can be harvested in 3 years. The largest bamboo, known as timber bamboo, can grow to 120 feet with a 13-inch diameter in three years, and it is named timber because it is at least two times stronger than lumber of the same proportions. Bamboo is self-renewing; after harvesting the root system remains healthy and unharmed, ready to produce more shoots, just like a grass lawn. It is critical that bamboo is harvested at the height of maturity and strength. The best time to harvest bamboo is in the fall or winter when the ambient moisture level is relatively low. Harvesting in the summer will likely cause the bamboo to split during the curing process. After cutting the bamboo, logs are sliced into long strips and then are ready for further processing. The strips are then cut into approximately the width that you see in the final bamboo flooring. The bamboo can be left it’s natural color or it can be darkened. The process of darkening the bamboo is done next. This brings out the color. Strips are often steamed and then boiled to eliminate sugars and insects. This is called carbonization, and this process weakens the bamboo. Dark shades of bamboo are not recommended for flooring because of the potential for damage especially in high traffic areas. After this purification process, inspection takes place to grade bamboo. There's always a market for good or average bamboo. Grades A or B are sorted. Grade B is sold to discount manufacturers for inferior flooring. To insure proper moisture content bamboo goes through a drying process. Improper drying of bamboo can lead to fungus and deterioration of the flooring. The drying process takes a few days and is done in a kiln. The next step in the manufacture of bamboo flooring is the gluing process. The strips are glued together under extremely high pressure and heat in either vertical or horizontal formation creating large boards. The pressure and heat assure a strong, stable bond. Using formaldehyde glue, the strips are bound together. There are no quality controls in place to monitor the amount of formaldehyde used during this process. Usually any manufacturer of quality bamboo flooring uses less than the amount of formaldehyde allowed by United States quality controls. In producing low quality bamboo products, high levels of formaldehyde glues are used. Formaldehyde glue is a known carcinogen and it’s presence in bamboo products will emit a gas for years after manufacture. Low quality bamboo flooring should be avoided. Bamboo flooring may also be classified as Vertical and Horizontal. Vertical flooring results in a smooth uniform appearance. Horizontal flooring results in a look that appears more natural. The nodes of the bamboo remain visible at random intervals. Vertical flooring is available only in one thickness but horizontal flooring is made with many layers depending on the thickness desired by the manufacturer. 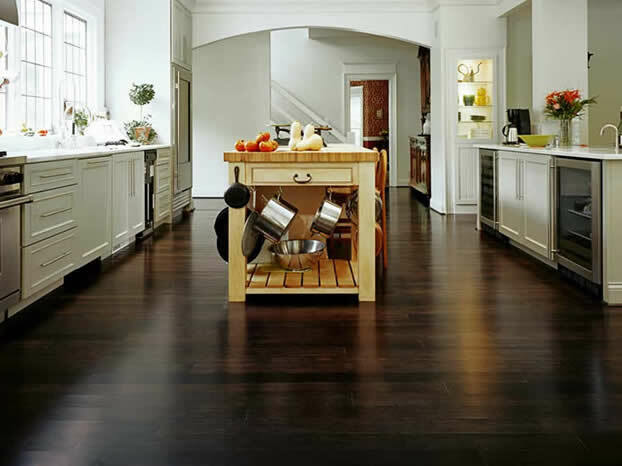 Much like traditional hardwood, bamboo flooring is designed in a tongue and groove system. You can determine quality by examining the edges of the planks. If you can see gaps and splits, either filed with adhesive or left as is, then you know it is an inferiorly manufactured plank. The ends should be uniform to insure maximum adhesion and prevent movement. After milling, the bamboo is given an aluminum oxide coating to increase it’s strength, endurance and protect it from stains. It is then ready for installation. Bamboo is quickly becoming an eco-friendly alternative to hardwood flooring. In addition, it can also be a durable, high quality and beautiful choice for your flooring. The following article was taken directly from Online Tips (http://www.onlinetips.org/how-bamboo-flooring-made). Also, please visit my websites at www.americarpetfloors.com and www.stylishrugs.com for all your flooring needs.